Published: Oct. 19, 2014 at 10:12 p.m.
San Francisco 49ers quarterback Colin Kaepernick throws a 37-yard pass to wide receiver Brandon Lloyd. 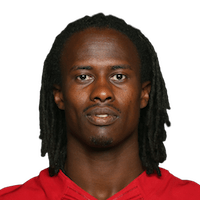 Published: Oct. 13, 2014 at 09:52 p.m.
San Francisco 49ers quarterback Colin Kaepernick throws an 80-yard touchdown pass to wide receiver Brandon Lloyd. Published: Jan. 1, 2012 at 07:24 p.m.
(9:06) K.Clemens pass deep left intended for B.Lloyd INTERCEPTED by T.Brown at SL 18. T.Brown to SL 13 for 5 yards (S.Spach).